City of Warrenville issued the following announcement on April 10. With the April 15 tax deadline approaching, Internal Revenue Service (IRS) scams are often committed against unsuspecting victims. 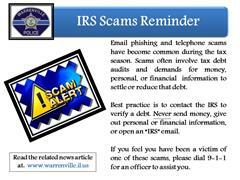 The Police Department would like to remind everyone that the IRS does not call or email an individual to inform them of a tax debt, nor will they call or email to make arrangements to settle or reduce a debt. If there is legitimate tax issue, a letter will be sent from the IRS explaining the liability and the appropriate course(s) of action to resolve it. And, while both forms of scams typically target personal or financial information, persons receiving a telephone call may feel more pressure to comply. Most often this type of scam involves an exchange of cash or cashier’s check, the wiring of money, or the purchasing of internet gift cards. If you receive a call from someone claiming to be an IRS criminal investigator or agent, inform the caller you will be verifying the debt through the IRS and hang up. If they become belligerent or threatening, do not continue the conversation, simply hang up and dial 9-1-1 to report the incident. If you receive an email and it has been inadvertently opened, do not click on email links or attachments, as these could contain a phishing virus. The best practice is to delete the email before it is opened. In all cases, do not provide money, or personal or financial information. 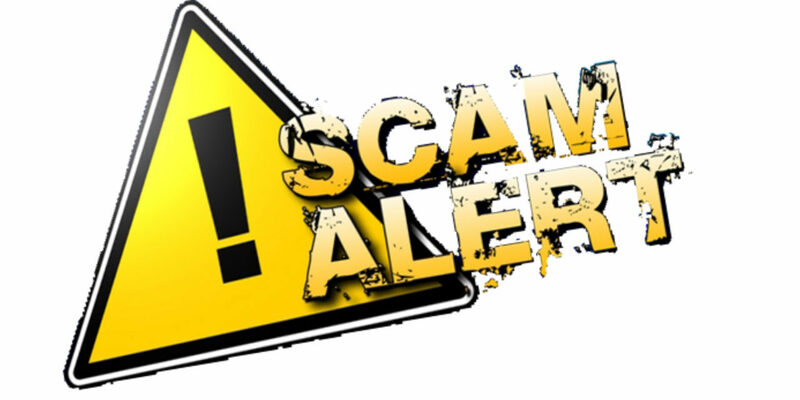 More information on tax scams can be found on the IRS website (Tax Scams / Consumer Alerts page) at the link provided below.